- Check on stratification: Some seeds require stratification, which is exposure to a period of cold or freezing temperatures in order to break up the seeds outer protective coating so it can germinate. This can be done in the refrigerator or freezer. You can find out what seeds need stratification either on the seed pack or online (however some seed packs do not include this information). - Figure out when to plant: How early you start seeds can range from 8-10 weeks to 1-2 weeks before last frost, depending on variety. When is last frost? You can see that on this map. - Get containers: Generally, the best thing to start seeds in is a multi-cell seed starting tray that you can get online or at any big box garden store. If you saved annual six or four pack containers from last few years, you can use those, but make sure you sanitize them in a 10-1 water/bleach solution. - Get soil medium: Seed starting mix is great, but you can also use potting soil, which is more economical. - Think about what you’ll need to keep seedlings alive: This not only includes what you may need to buy, but what you need to do. For example, damping off disease is a fungal disorder that kills seedlings rather quickly. You can combat this by sprinkling a little cinnamon on the surface of the soil, or making sure there’s good air flow around the seedlings. 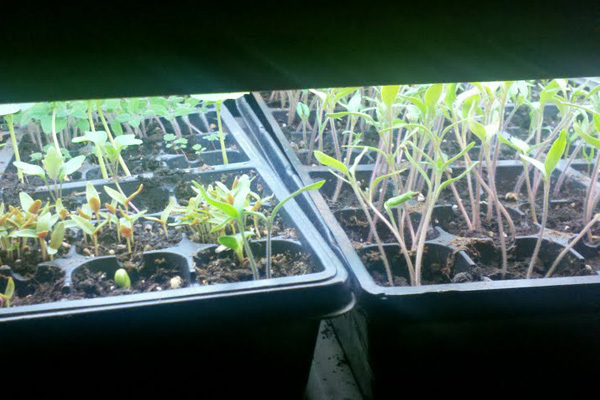 Also, make sure you have proper lighting (a shop light actually works well for seedlings).